There was a time when David Moyes would not have even considered making the move from Everton to Old Trafford. Everton were England’s finest and they certainly had the upper hand on their Manchester rivals. Back in the 1984-85 season Everton were progressing towards an 8th League title (one more than United had at that time) when the Red Devils arrived at Goodison. They left with a hiding, thrashed by a rampant Everton team, who on a balmy Saturday afternoon on Merseyside, scored five to record a resounding victory. The Everton team who took to the field, from 1 through to 12 are all considered club legends. The team was so good, that the travelling Everton support still sing their names to this day. Southall, Stevens, Van den Hauwe, Ratcliffe, Mountfield, Reid, Steven, Heath, Sharp, Bracewell and Sheedy, with Andy Gray coming off the bench. A team to make Evertonians proud. 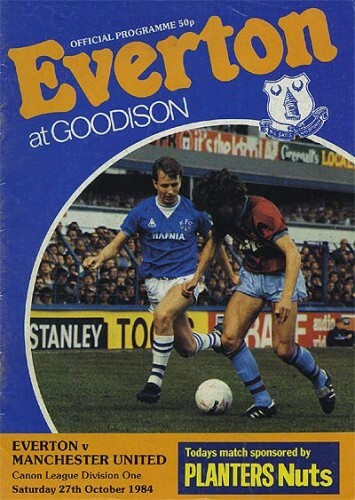 Everton were two up inside 13 minutes, Kevin Sheedy first scoring a brave header from the edge of the box, before he ran through and clipped the ball past Bailey in the United goal. Adrian Heath made it three before half time, guiding a driven cross from Trevor Steven into the back of the net. Everton’s fourth and fifth came in quick succession. With game entering it’s final 10 minutes, Gary Stevens drove the ball home from outside of the box, followed minutes later by Graeme Sharp heading home Everton’s fifth. If you haven’t seen the game before, enjoy the two videos of the game below. For those who remember the glory days from the 80’s enjoy and reminisce. The first video has brief highlights of the game, with the second video showing just the goals. We have a large number of Everton videos on our YouTube channel. If you want to see more, search for StDomingosEFC on YouTube or click on the St Domingo’s TV link on the left hand side of the screen. Next Post Should we have appointed from within?